He is not in the Hall of Fame, never played in an All-Star game and is about a foot shorter than most NBA stars. But try to find an NBA legacy more lasting than David Stern’s. The game is about the players, and nobody understood that better than the commissioner, who is retiring Saturday after exactly 30 years on the job. He would likely say that the league is where it is because of Bird and Magic, Kobe and Shaq, Michael Jordan and now LeBron James. Players wouldn’t forget to include Stern on the list. "I think he is the greatest person in NBA history. He made everything happen," said Yao Ming, the former Houston center from China and one of the most important of the many international players who found homes in Stern’s NBA. A league that had been struggling just to find its footing in the U.S. — in the early 1980s weekday games of the NBA Finals were shown on tape-delay — is now one of the most popular in the world, a $5.5 billion industry with the highest-paid team athletes in sports. Now Stern, 71, hands it over to Deputy Commissioner Adam Silver, his longtime top aide. Stern is leaving quietly, refusing most interview requests because he isn’t interested in discussing himself. But others have had to plenty to say about what he accomplished, and how. The man who ended up with the most important job in basketball was an attorney when he joined the league in 1978, saying he figured he could return to his legal career if the NBA didn’t work out. Columbia Law School couldn’t have prepared Stern for everything he would need to know after replacing Lawrence O’Brien and becoming the league’s fourth commissioner on Feb. 1, 1984. So Stern simply dedicated himself to learning it. 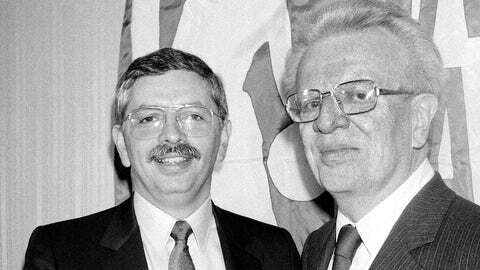 Incoming NBA Commissioner David Stern (left) shakes hands with outgoing commissioner Larry O’Brien in 1983. "He reinvented himself in my mind. He was a young, very highly thought of lawyer when he came into basketball. And he made himself a marketing guy. He just put his mind to it and he really got himself involved in new technology like cable television, which was a kind of a new thing back then. So he was prepared to take the league to another level." — USA Basketball chairman and former Phoenix Suns owner Jerry Colangelo. Asked before this season about the NBA’s plans to put nicknames and sleeves on some uniforms, Stern made it clear he wasn’t involved, adding that the league’s decision was influenced by "so-called branding experts." "I used to think I was a branding expert," he said. Those who worked for Stern would say he was, because he made himself an expert at so many things. From the way the players dressed — on and off the court — to the length of lines at concession stands, nothing was too minor for Stern’s involvement. "He was the kind of guy, like if you were playing a chess game, he was 10 moves ahead of you all the time, and it didn’t matter what the discipline was. If it was PR, event operation, merchandising, legal, one thing after another, the guy was good at it and great at it." — Former NBA executive Terry Lyons. Stern has said he’s proudest of the league’s diversity, and that goes from the court all the way up to the league office. There are a dozen black coaches, and women and minorities hold a number of key positions. The final owner Stern welcomed into the league, Sacramento’s Vivek Ranadive, is a native of India. "It happened very quietly, without forcing people into positions. There was no quota, no Rooney Rule, none of those things. There was just appointing people of different race, different color, different gender to senior positions and it happened at the league level and team level. It seemed to happen naturally, but you have to give him a lot of credit because it happened under his watch." — Miami Heat owner Micky Arison. Women’s sports leagues usually come and go quickly. But riding a wave of popularity in the mid-90s, two women’s basketball leagues opened for business. The ABL came first, with more overall talent. The WNBA had Stern’s backing, playing in NBA arenas, with the support of NBA’s sponsors and being televised on the NBA’s partner networks. 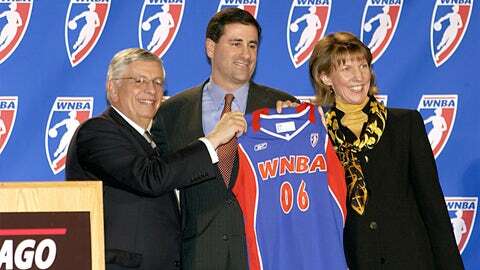 Stern holds a ceremonial jersey during a press conference to announce the new WNBA Chicago expansion team in 2005. The ABL didn’t last long. The WNBA is still around nearly two decades later, with 12 teams. He’s said he wishes it were 24 — but it might be none without him. "There wouldn’t have been a WNBA at all if it wasn’t for David Stern. The WNBA wouldn’t still exist if it wasn’t for David Stern. That was one of the factors that played into me playing in the WNBA instead of the ABL, was it had the NBA’s backing and just as importantly if not more importantly David Stern’s backing. If you know him even a little bit, he’s not a guy who wants anything to fail. And so him starting this league, he would make sure it wouldn’t fail in those early stages." — Rebecca Lobo, an original WNBA player. More teams, more jobs, more money. Lots more money. The NBA added seven teams under Stern, bringing its total to 30, has had its games televised in 215 countries and territories, and its revenues increased by 30 fold. Player salaries have soared to an average of more than $5 million per season, and the national TV deal is worth $930 million annually. He has said the growth will continue after he leaves. 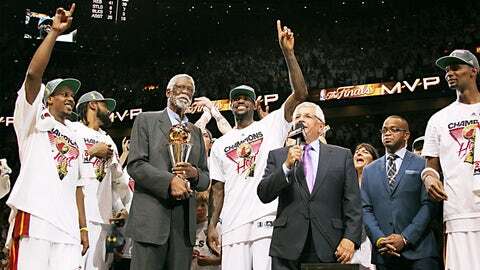 Stern presents Miami’s LeBron James the Bill Russell NBA Finals Most Valuable Player Award in 2012. "David Stern, who in my opinion has been the best commissioner in any sport, has taken the NBA to a whole, whole other level, even probably higher than his expectations. So that’s what Adam’s going to have to be competing against. It’s going to be interesting, to be honest with you, because I don’t see how you can make the NBA more successful than David Stern has, but they’re going to try." — Hall of Famer and TNT analyst Charles Barkley. 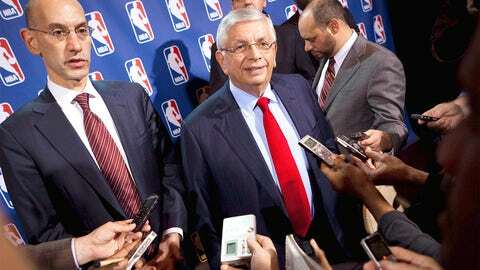 It’s probably fitting that Stern’s final news conference as commissioner took place in London, since the NBA’s international growth is perhaps his greatest achievement. The NBA has played nearly 150 international games, including the one between Brooklyn and Atlanta that Stern spoke before earlier this month, and the rosters of its teams are now loaded with foreign players. Stern frequently noted that of the 36 players on the medals podium at the 2008 Olympics, 26 played in the NBA. 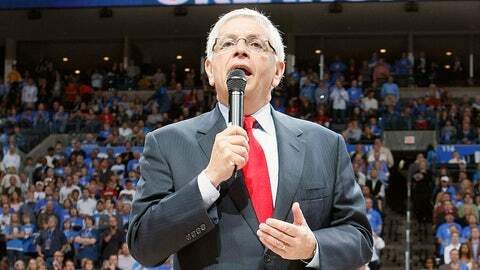 Even after leaving office, Stern has said he will remain committed to advancing the NBA’s opportunities overseas. "I don’t even know who’s the second sports commissioner who did so much. Maybe, like (former) Olympic community (president) Juan Antonio Samaranch. But David Stern . . . he just globalized it, and right now how many countries know NBA product, and know people, know players, know coaches and know the game and (it’s) televised all over the world. And you remember when he came in, it was like only 50 states that watched the games." — Russian forward Andrei Kirilenko of the Brooklyn Nets. No player felt the wrath of Stern more strongly than Metta World Peace. The former Ron Artest was suspended 72 games after charging into the stands and inciting a brawl between Indiana Pacers players and Detroit Pistons fans on Nov. 19, 2004. It was perhaps the ugliest moment in Stern’s tenure. The next year would come a dress code for players not in uniform and a community service initiative called NBA Cares, all aimed at restoring the players’ popularity. 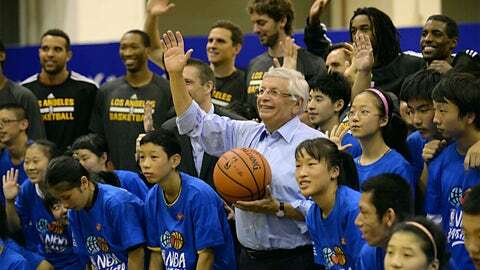 Stern waves to the crowd during the NBA Cares Special Olympics Clinic as part of the 2013 Global Games in China. As for World Peace? Nobody would’ve blamed Stern if he held a grudge. But guess what happened? "David would sometimes just reach out to me and ask me how am I doing, especially after I got suspended. That was a small bump in the road so to speak. But other than that, David would reach out to me, see how I’m doing, and I reached out to him when I found out he was retiring and told him good luck and he had a great career, congratulations." — Knicks forward Metta World Peace. The NBA seemed to be on a roll in 2011, with James reaching the NBA Finals in his first year in Miami to bring a new level of worldwide attention. But many owners, some hit hard by the financial crisis, were suffering heavy losses and wanted major changes. That meant Stern had a job to do. He locked out the players until a new collective bargaining agreement was reached, losing games to a labor stoppage for the second time in league history, both under his watch. Players who were guaranteed 57 percent of basketball revenues in the previous deal accepted a 50-50 split that saved owners about $280 million a year in salary costs, but not until the season was reduced to 66 games. The league played only 50 in 1999, but that came with an agreement on maximum salaries. It may have been ugly, but when owners wanted a new model, Stern delivered it. "I think David’s primary concern was the owners and the economic success of the league. It was all about return on investment. David’s job was to enforce the will of the owners and not the players. But that is the theme for all commissioners, not just the NBA." — Former NBA Players Association executive director Billy Hunter. Some of the toughest situations Stern faced late in his tenure involved franchise movement. He couldn’t help Seattle get a deal for a new arena that would’ve kept the SuperSonics there, one of his great failures, and they moved to Oklahoma City. Stern addresses the Oklahoma City Thunder fans minutes before the inaugural game against the the Milwaukee Bucks in 2008. But he fought to keep a pair of teams in smaller markets, even when bigger dollars perhaps waited if they moved. The NBA even took ownership of the-then Hornets from George Shinn until it could find a buyer who would keep the team in New Orleans, a situation that became uncomfortable when Stern had to make the heavily criticized decision to kill a trade that would’ve sent Chris Paul to the Lakers. And when he could’ve overseen the NBA’s return to Seattle after the owners of the Kings had a deal to sell the team, he instead gave Sacramento Mayor Kevin Johnson the chance to put together plans for local ownership and a new arena that kept the team in California’s capital city. "He didn’t make short-term decisions, he made long-term decisions. Keeping teams in a city creates a huge value proposition for expansion cities. If you invest in the NBA with a new or upgraded arena, the team will stay. If you don’t, it won’t. That has gotten us better arenas, greater commitment and it was a lesson learned from Seattle." — Dallas Mavericks owner Mark Cuban. Stern hasn’t said what he plans to do, beyond that he will keep working. He wouldn’t even allow the word "retire" to appear in the October 2012 statement announcing his plans to step down, because that would imply he was going to be inactive. He’ll probably end up visiting China, India, or someplace else he sees potential for even more growth for the NBA. "Right now I have decidedly refrained from making plans. I think on Feb. 2 I’m still going to be taking all of the junk that I moved out of my office and deciding how much of it to keep, how much of it to dump on Adam’s doorstep and how much to throw out, so I’ve got a fair amount of work to do, and I’m planning to do some skiing before I get to that, and then we’ll see." — Stern, at his final news conference. AP Sports Writers Kristie Rieken in Houston, Tim Reynolds in Miami and Doug Feinberg in New York contributed to this report.